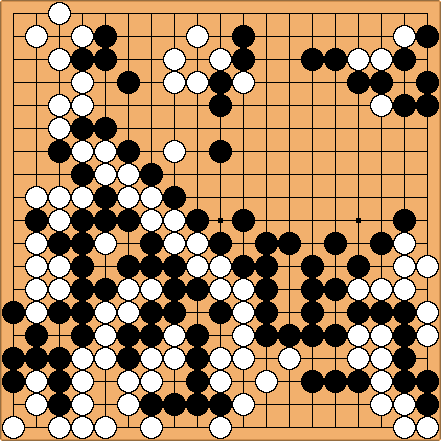 A roughly hour-long lecture on the game by Nick Sibicky can be found at https://www.youtube.com/watch?v=me5UIHoEP9M (Nick Sibicky Go Lecture #205 - The Lee Sedol Ladder Game). DJ: Well, Black played a flamboyant manoeuver, chasing White in a ladder that was not expected to work, just to be able to play in sente in order to capture all the marked White stones in the BR corner! And at the cost of seeing many, many of his stones played in the non-working ladder captured in a series of double atari. JangJirak? Despite the broken ladder, this exchange is a huge loss for W. However W was forced to play this way, which I'll explain below. 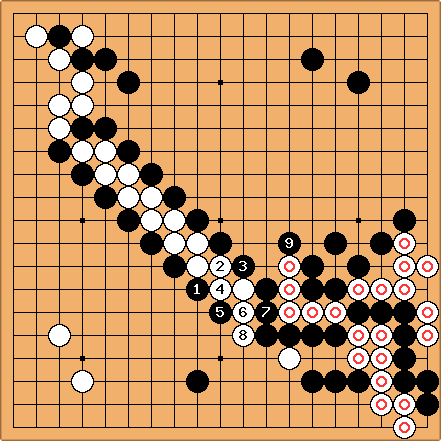 Scryer: However, as it turned out Lee continued to present Hong with more urgent situations to solve, until finally Hong resigned without ever getting around to taking ANY of Lee's hanging ladder stones. JangJirak? Actually, was the surprise move that forced W to play out the exchange. No matter what W does now, W can't avoid a huge loss. W admitted he didn't notice this move and was shocked to see it; otherwise he would have avoided it before. Note the timing of in the previous diagram. Lee played out a few moves of the broken ladder before this foreplanned ambush move, giving W no chance to escape his plan. Lee had read this all out already when he played his first move around the UL corner before this sequence (that is E17), and considering this was a blitz game, it's amazing isn't it? Alexandros? : That very fact is what makes it impressive. The fact that they have worked and studied enough to see those at a glance. Saying that's not impressive is like saying that an Olympic long jumper isn't impressive because, hey, he jumps all the time. Uberdude It is a seki, which given black's large profit elsewhere is a great result for him. tijnhet? The dispute seems to be valid. 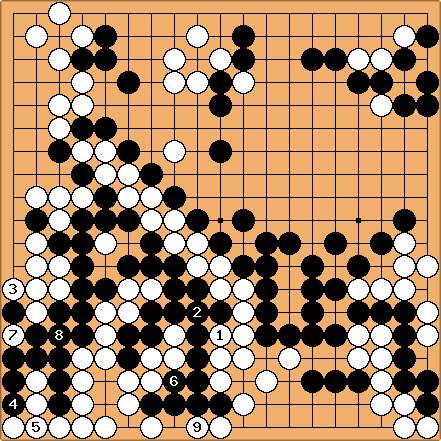 A 9p chinese pro commented on the game that white is dead in the corner, leaving black at about +120 points. 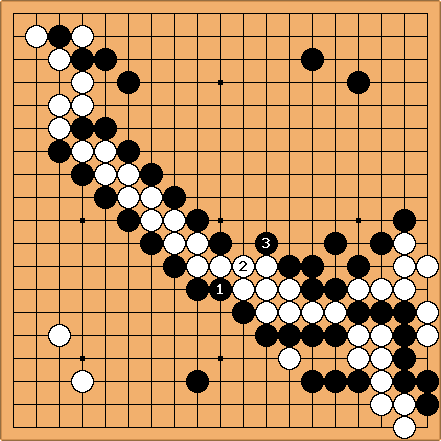 Also Al Younggil 8p commented that white is dead. 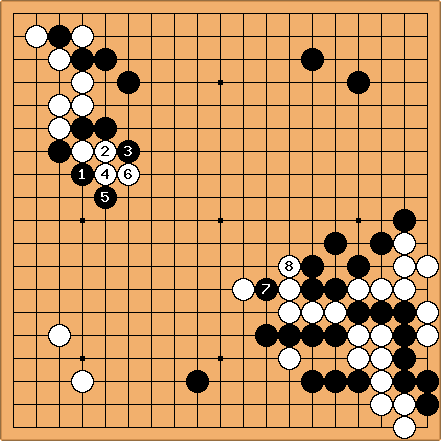 Trying to find the seki with several 4dan players for 45 minutes resulted in nothing but white being dead in the corner unless black made a mistake. So it is, contrary to what Uberdude has said, not a seki. sigmundur? Can you show how black kills? To me it seems they both have one eye, and discounting the kos black's outer liberties are taken before white's inner ones. Maybe some black must use the kos? OmnipotentEntity? White has 2 liberties in an eye. One in a ko. And two internal liberties, one of which can be taken in sente (so it doesn't count). Black has 2 liberties in an eye. Two in half eyes (both of which can be taken in sente, but one requires an approach, so only one counts). Two internal liberties, and 3 external liberties. So black is ahead by 2 moves, enough to ignore a forcing move or prevent a seki. 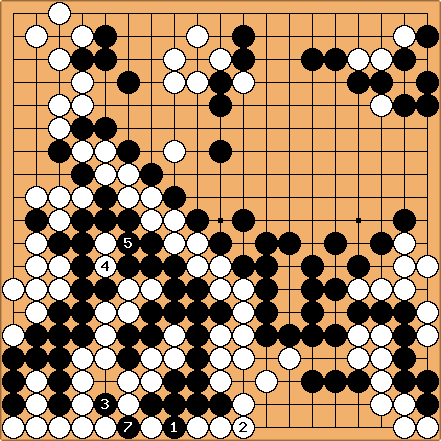 One possibility: White K5, bJ6, wA7, bA2, wB1, bH3, wA5, bC5, wJ1, bH1, wL1, bE2, wE8, bF9, wE8, bF1, wKoThreat, bResponse, wG1, bA6, Black is alive in double ko. White is dead. w6 at w4. White is dead in double ko.